A Sleepy Half Assed FOTD. I haven't been to sleep yet but thought I'd show you my sleepy attempt at a FOTD. I look pretty dead so let's just ignore that. Selection of shadows from the Urban Decay Naked palette. 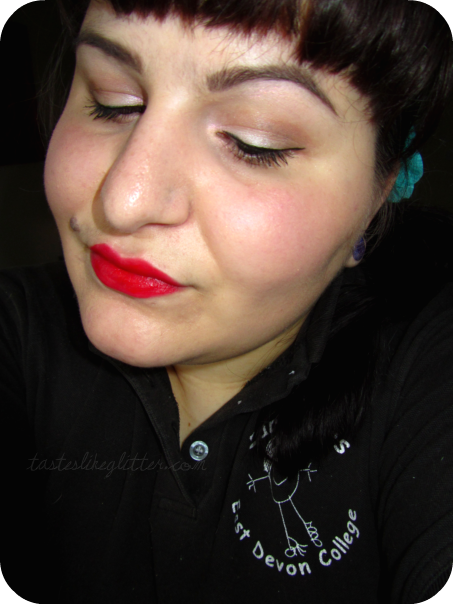 Revlon Colorburts - True Red. Far too tired to list products used and I've not even started work yet. Today is going to be fun. If you want to know what anything is, ask. Someone Call The Doctor, Cause I Lost My Mind. This One's For You, Ale! Partial To Neons: Une Partie Deux.